The Cooper Hewitt, Smithsonian Design Museum is currently showing the fifth iteration of its Design Triennial; called simply “Beauty,” the museum has mounted a complex and ambitious show, deftly navigating such a subjective and fraught theme. Curators Andrea Lipps and Ellen Lupton have organized all this beauty—there are more than 250 objects by 63 international designers in the show—into a set of enticing and useful sub-categories: Extravagant, Intricate, Ethereal, Transgressive, Emergent, Elemental and Transformative. The show is on view through August 21. The iridescent graphic introducing the show. Those very specific modes of beauty notwithstanding, I’m going to focus on a different kind of distinction here. Rather than contrasting, for example, intricacy and elementality, it is more interesting to consider the ways some of the objects in the show might interact with culture, politics or activism beyond the museum. Hyper-luxury commodities are a mainstay of design exhibitions, which makes perfect sense. Not only is that an effective way for forward-looking design to fund itself, but design in that vein, obviously, can be more easily well-enough funded to result in the kind of refinement and execution that gets design objects noticed by curators. These high-end objects can be breathtaking and brilliant: an avant-garde leather jacket that changes color based on wind speed and temperature, 3D printed glass vases that refract light with exquisite delicacy, etc. But instead of surrendering to the charms of high-end luxury, the projects I discuss below are concerned with more progressive issues—that’s progressive in the political sense. By this, I mean objects that embrace such values as environmentalism, recycling, inclusiveness, education, demystification, empathy, respect, restraint, and so on; these projects are about a utopian impulse and creative problem solving for the collective good. In a museum full of sparkling glamour, these five projects are less gleaming and more thoughtful—of course, they are also still quite beautiful. Brazilian designer Brunno Jahara has a keen eye for recycled plastic and its artistic possibilities. The Multiplastica Domestica series derives its inspiration and materials from the designer’s local recycling center. The working lamps and tiered bowls Jahara makes from this plastic are beautiful and playful. These simple objects achieve an elegant balance of forms and overall grace, but never stop looking exactly like the bricolage of discarded plastic packaging that they are. As the Cooper Hewitt explains, this body of work “unite[s] sustainability, sculptural quality, and functionality.” This might be a very literal example of the importance of and potential for recycling, but these ornate, candy-colored objects are much more than the sums of their parts. A powerful and evocative visualization of Alzheimer’s. To make this cabinet, Markunpoika started with a simple, traditional wooden cabinet. He cut tubular steel, a classic industrial-design material, into thin rings, which he welded together into a loose, incomplete lattice around the wood form. Then he burned away the cabinet, leaving the steel lattice empty of its solid substance and scorched black. He has found a very powerful and evocative way to communicate the pain and loss his and many other families endure when someone has Alzheimer’s. British designer Alexandra Daisy Ginsberg practices a kind of whimsical, mad-science-fiction environmentalism. She uses—and exposes their inherent potential for gently-mockable self-seriousness—the languages of ecology and patent application to propose a system of invented autonomous synthetic biological devices to rescue dying forests. The title of the project refers to the concept of the sixth extinction: Over the past 500 million years, life on earth has experienced five cataclysmic die-outs, of which the asteroid that killed the dinosaurs is the best known. Scientists and activists see the sixth episode of mass extinction as caused by the impact of humans on the rest of the world’s natural environments—and currently under way. Ginsberg’s project includes detailed, “life”-like renderings; patent drawing-style diagrams; and some 3D-printed resin models of proposed devices that look and behave more like organisms than machines. The patent drawings are highly detailed, but wholly unclear on the exact mechanisms by which these self-consciously cartoony, unrealizable devices work. The Self Inflating Antipathogenic Membrane helps trees fight Sudden Oak Death; the Mobile Bioremediation Unit is an engineered slug that neutralizes soil made acidic by pollution; Bioaerosol Microtrapping Biofilm self-replicates on tree leaves to trap pollution from the air; and the Autonomous Seed Disperser collects and, well, disperses seeds to bolster biodiversity. These fantastical, clever “devices” poke a little fun at bio-technological futurism, but provocatively address a real, vital environmental problem. The block of text at the upper left explains that, despite Obama and Medvedev agreeing to reduce their nuclear arsenals, world-wide military spending only continues to grow. Francesco Franchi is an Italian graphic designer and the art director of a monthly news magazine IL (Ideas and Lifestyle). He is a masterful composer of infographics, building dense, ingenious, creative presentations condensing and clarifying huge swaths of statistical information for the general public. Franchi has an immediately recognizable style, but, far from having a uniform look, his infographics remain dynamic and specific to the subjects. Creative and effective communication is a progressive value. 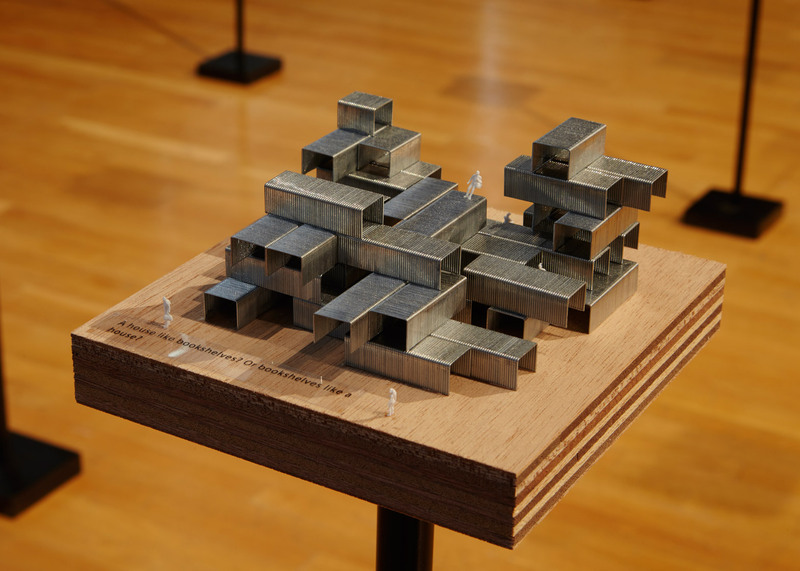 Admittedly, half of why I’m including these miniature architectural models in this list is the sheer delight they inspire. Japanese architect Sou Fujimoto created this array of playful, roughly-built maquettes out of artfully arranged bricks of staples (these links are to fun, close-up images), matchbooks, ping pong balls, screws, Pringles, paper and a variety of other common, modest, non-architectural materials. 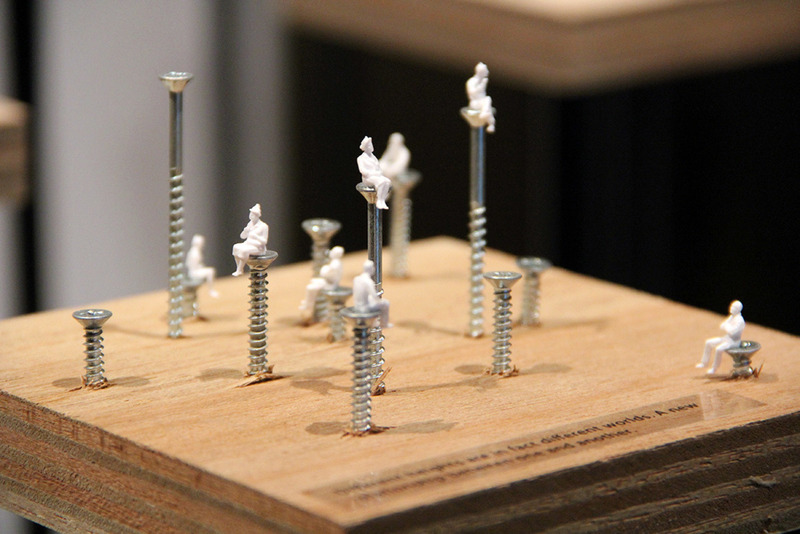 Each small model is populated with charming, impossibly tiny plastic human figures, which give anything an architectural scale by comparison.